MEET JOHN DOE, based on Frank Capra’s beloved film, is an epic, Depression-era musical about media, politics and the American Dream, which features a powerful score, razor-sharp dialogue and an iconic female lead. When ambitious newspaper reporter Ann Mitchell loses her job, she prints a phony letter from a “John Doe” who promises to jump off the Brooklyn Bridge on Christmas Eve to protest the state of society. Circulation goes through the roof and Ann convinces her editor to hire an out-of-work ballplayer to play “John” while she ghost-writes a column. With her words and his down-home charm, John Doe quickly becomes a national sensation and a complicated romance blooms between the pair. When the paper’s powerful owner reveals his true plans for the John Doe movement, Ann and John must confront the hoax they've created and decide what is worth fighting for. Description Tags: Strong Role for a Leading Woman • Musical Comedy • Musical Drama • From the World of Literature • Political Satire • Period Piece/Historical • Classic Broadway • Contemporary. "Politics, passion and populism ignite the stage in the tuneful musical Meet John Doe"
"a smart and feisty show wrapped in a big Broadway sound." “a great story about watching out for your fellow man that relates to the original time period as well as to today. It incorporates big Broadway-style tunes — original jazz and lyrics, that make you feel as if it's 1931..."
1924 – 1939: Writer Richard Connell writes the satiric short story “A Reputation,“ about a clerk who threatens to drown himself in New York City’s Central Park Reservoir in protest against the state of society. This leads to a screenplay by Connell and screenwriter Robert Presnell called “The Life and Death of John Doe,“ about a poor worker at Grand Central Station whose announcement of his intention to commit suicide sparks a national populist movement. Film director Frank Capra and screenwriter Robert Riskin buy the rights to “A Reputation“ and “The Life and Death of John Doe“ and create their version of the story entitled “Meet John Doe,“� which starred Gary Cooper and Barbara Stanwyk. The film, for which Capra filmed five different endings, opens in 1941 and is nominated for an Oscar for its story. 2001-2002: Andrew Gerle and Eddie Sugarman write and workshop a contemporary version of the John Doe story. Finding the modern setting does not work, they start over with a musical adaptation set at the height of the Great Depression. 2003-2004: Their new version of the show is developed in the BMI Musical Theatre Workshop. In the fall of 2004, a sold-out production of Meet John Doe is presented as part of the 1st Annual New York Musical Theatre Festival. 2005: Meet John Doe is developed as part of the American Society of Composers, Authors and Publishers (ASCAP) Musical Theatre Workshop. In the fall, Meet John Doe is selected for the National Alliance for Musical Theatre's annual Festival of New Musicals. 2006: Andrew and Eddie develop the show at Theatreworks in Palo Alto, CA; Carousel Dinner Theatre in Akron, OH; and The Hartt School in Connecticut. Also this year, Eddie and Andrew win the Jonathan Larson Grant for their work on Meet John Doe. 2007-2008: Meet John Doe is extensively rewritten and plays Goodspeed Musicals in Connecticut in preparation for its world premiere production at Ford’s Theatre in Washington D.C.. The Ford’s production, with orchestrations by Tony Award-winner Jonathan Tunick, is a hit, resulting in rave reviews, an extension and 9 Helen Hayes Award nominations. Lead actress Heidi Blickenstaff and director Eric Schaeffer win Helen Hayes Awards for their work on Meet John Doe. 2011: Porchlight Music Theater of Chicago produces the Midwest premiere of Meet John Doe and Andrew and Eddie continue to rewrite the show including all-new, five-piece orchestrations by composer Andrew Gerle. 2012: R&H Theatricals licenses this new American musical, making it possible for everyone to Meet John Doe. — 2011 Joseph Jefferson Award Nomination for Best Lead Actress in a Musical to Elizabeth Lanza for playing "Ann Mitchell" in the Porchlight Music Theater production in Chicago. — 9 Nominations for the World Premiere of MEET JOHN DOE at Ford’s Theater including 2 Awards for Outstanding Lead Actress in a Musical to Heidi Blickenstaff for playing "Ann Mitchell" and Outstanding Direction of a Musical to Eric Schaeffer. — 2004 selection (Inaugural Season) with [title of show] and ALTAR BOYZ. We’ve lived with this story and these characters for over a decade and counting. As in any long-term relationship, you come to know them, love them and accept that there are some things about them that you can’t and probably shouldn’t change. So here’s our two cents. Ann Mitchell is a tough cookie. She’s a nervy, brassy broad who could care less that she’s in a man’s world. She makes immoral choices in this play, but we cheer her on because she is so damn resourceful and nervy. Importantly, she is also in a desperate economic environment and fighting for survival, which helps us not condone, but understand her choices. But let us be clear: Ann’s conscious choices lead to monumental consequences. No one points a gun to her head. Don’t try to let her off the hook; she must be held accountable for the play to have its intended impact. This is Ann’s show and we strongly recommend that you cast a warm, likeable actress. Ann’s dialogue and actions are “sharp-elbowed” and manipulative, and casting an actress who reads as cold or calculating can quickly turn the audience against her. She’s got to have the singing pipes and the acting chops too, of course. The pace and rhythm of this show are crucial. There is a snap and pop to the dialogue that makes it sing when it’s cooking and when it's delivered exactly as written. We have been meticulous in crafting the flow, rhythm and punch of every line as if it were a musical score, so it is imperative that actors be word-perfect. When in doubt, “Faster! Louder! Funnier!” works really well with this script and allows the slower, more deliberate moments to land and resonate effectively. The films of Billy Wilder and Howard Hawks as well as everything Aaron Sorkin has written are good guides. Ann Mitchell - Early thirties, smart, ambitious newspaper reporter who's less cynical than she thinks she is. John Willoughby - Thirty, down-and-out ex-baseball pitcher, tall, plain-spoken, with a deep sense of fair play. D.B. Norton - Forties-fifties, a ruthless, charming and wealthy oil mogul turned newspaper owner. Richard Connell - Late fifties, an experienced and unsentimental newspaper editor; surprisingly, also a true patriot. The Colonel - Fifties, professional hobo and grouch, suspicious of the system and intent on living 'off the grid'. Beany - twenties, Connell's high-strung assistant who reveals a sober, mercenary side. *Promotional video rights can only be granted once a performance license for Meet John Doe has been secured. Please contact customer service if you have any questions. 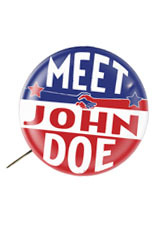 If you have not yet applied for Meet John Doe, you can do so here. LOG IN to learn more. *You must be logged in and licensed to present Meet John Doe in order to license Archival rights. Please contact customer service with any questions. *You must be logged in and licensed to present Meet John Doe in order to license Distribution rights. Please contact customer service with any questions.